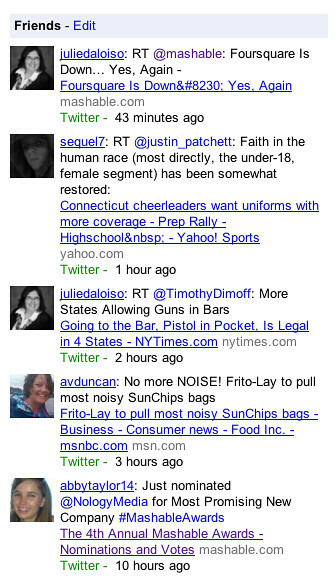 A week ago at Search Engine Land, I reported Google News is testing Twitter integration. Google News is experimenting with allowing some users enter their Twitter username and receive personalized news based on what their friends are reading and their friends interest. Google describes this feature as "an experimental section in the side column that helps you find news articles that your friends are sharing on Twitter." Of course, technically you can enter anyone's Twitter username and see news related to their friends - which is not a privacy issue, but it is available. Google explained, "If someone you follow has shared an article or a link that cannot be found in Google News, then you will not see that update in the Friends section."